The Cornea is the transparent ´window´ for the incoming light at the visible anterior side of the eyeball, whereas the rest of its wall is built by the opaque Sclera. The moist mucosal tissue of the OCULAR SURFACE is located at the anterior surface of the eyeball. The Conjunctiva of the eyeball is located on the outside of the sclera and it is continuous with the moist epithelium of the Corneal connective tissue, termed as the ´Stroma´. The sclera is basically built from the same material as the cornea. The latter is clear and appears inserted into the sclera as a glass into a watch. The building material of the connective tissue is to a large extent the protein ´Collagen´ in fibrillar types. The smallest functional unit here is a collagen fibril. Collagen fibrils in very regular arrangement form the corneal stroma. In the Sclera mainly larger accumulation of collagen such as collagen fibers and fiber bundles occur. Therefore the cornea and the sclera can be continuous although there is some distinct difference in the structure, that can be seen already in the light microscope, and certainly produces different levels of transparency, as very obviously seen from the outside. Most of the wall of the eyeball is termed the SCLERA (from the Greek word for hard) because it is a thick connective tissue that is somewhat ´harder´ than the cornea. The Sclera is opaque and it appears whitish from the outside. At the visible surface, the Sclera is only covered by the translucent mucous membrane of the conjunctiva. The sclera shines through the conjunctiva and it is therefore the equivalent to what we see as ´the white in the eye´. The thickness of the sclera is roughly around 1 millimeter but it varies in different regions. It tends to be thicker in the posterior part and is thinner in the anterior part. It has 0,8mm thickness at the front before it transforms into the cornea. Particularly thin, with about 0,3-0,5 mm, is typically the Sclera in the equator region close to the insertion of the extraocular muscles (green arrows in the figure) - according to DUKE-ELDER. The sclera is basically built from the same material as the corneal stroma ... even though their characteristics are somewhat different - particularly with respect to the transparency for light. The building material is the protein ´Collagen´, the most frequent protein in our body by mass. It is composed of bundles of collagen fibers, that have a different arrangement. COLLAGENS and Connective Tissue - what is interesting to know ? COLLAGENS constitute a large family of structural proteins in the body. - most, but not all, of them are fibrillar and typically form protein meshworks that constitute a matrix for the population with different sorts of cells. This is the basis for all different sorts of connective tissues. Among other functions e.g. in the skeletal system, connective tissue ´connects´ other tissues into larger organs. The Corneal Stroma are composed of collagen FIBRILS ... that represent accumulations of even smaller building blocks (please see the figure to the right). In the Sclera the fibrils are packed in higher order structures such as collagen FIBERS and FIBER BUNDLES that result in a more coarse arrangement compared to the corneal stroma. There are a variety of different fibrillar diameters and spacing in different tissues and tissue layers. Every single of these varieties, of course, is perfectly custom tailored for the intended purpose, i.e. function. - there is no´one fits all´ in the body. Therefore the cornea and the sclera can be continuous at the corneal limbus - although there is some difference in their structure. This difference that can be seen in the light microscope, and certainly occurs as different levels of transparency ... as this is the basis for the entrance of light into the eye. AND HOW ABOUT TERMINOLOGY ?So ... even though anatomy is easy, terminology can be tricky. Cornea comes from the Latin word ´cornu´ which means ´horn´ ... and the name of the´keratocytes´ also means ´horn´-cells but this word comes from the old Greek word ´keras´. Latin words in nomenclature typically refer to the normal anatomy whereas Greek words are often used for pathological issues and diseases - but unluckily we can not always trust this ´rule of thumb´ because the Greek-named keratocytes are perfectly normal cells. Hmmm, but then, on the other hand, when they change their activity, e.g. by starting to produce inflammatory mediators.or particularly when they change their differentiation e.g. after wounding by acquiring muscle-like contractile abilities ...THEN they may be considered as pathologic ... well ... this appears to go beyond the scope of the present chapter and more details may be found e.g. in PUBMED. The Cornea and Sclera are continuous but have a different internal structural composition, that explains their characteristics. The sclera extends, at its inner and outer margin. slightly further in anterior direction over the start of the cornea (as seen in the figure to the right). The inner extension of the cornea is called the SCLERAL SPUR. It can be seen upon clinical inspection of the anterior chamber angle. The Scleral Spur this is the region where the trabecular meshwork, the start of the intraocular fluid drainage, appears to be fixed posteriorly, i.e. in direction to the Iris root.. The main difference between the translucent cornea and the opaque sclera lies in the arrangement of the collagen fiber bundles and in the content of water. The arrangement of collagen fiber bundles in the sclera is rather coarse and it has a higher content of water. In the cornea, on the other hand, the collagen fiber bundles have a highly ordered regular arrangement and there is a lower content of water. The low water content is achieved by the tightness of the epithelia on both sides and by the water pumps in the Corneal Endothelium towards the inside of the eye (please see further down). This is the present concept for the explanation of corneal clarity. The histological structure of the cornea is seen in a clinical photo, a schematical drawing and in two histological photomicrographs of increasing magnification. The cornea basically consists of a transparent connective tissue disc of certain curvature that is sealed by different epithelia at the anterior/outer and at the posterior/inner sides. The CORNEA (from the Latin word ´cornu´ for horn) forms the central clear part of the anterior surface in the optical axis of the eye. The cornea has a slightly smaller diameter of curvature than the somewhat thicker connective tissue wall (sclera) of the eyeball – therefore the cornea ´protrudes´ in anterior direction from the bulbar shape. The cornea covers the anterior chamber that is filled with an aqueous liquid like the whole interior of the eyeball. The ´insertion´ of the cornea into the sclera is often compared to the front glass of a watch. Its main purpose is to constitute a transparent optical medium for the entrance of light into the eye. The entering light is also refracted in order to produce a sharp image - this happens at the front side of the cornea and actually occurs at the air-to-tear interface, which is the Tear Film Lipid Layer (TFLL - for details please see the section on tears) on the surface of the tear film. The light is later adjusted by the LENS in order to make the ´fine-tuning´ for focusing on objects in near and in far distance. The eventual projection of a sharp image occurs onto in the RETINA at the posterior pole of the eyeball. For functional reasons, the cornea has relatively few constituents that may scatter light or may cause destructive inflammation as compared to other organs such as the surrounding conjunctiva and sclera. Thus the cornea lacks vessels but has a very rich system of small nerve fibers for corneal sensitivity and for ocular surface regulation of tear secretion by a neural reflex arc via cranial nerves and the brain stem (for details please see there). The blood vessels of the maintenance organ of the conjunctiva stop at the margin (limbus) of the cornea. This renders the cornea almost totally transparent .... but makes it dependent on the diffusion of blood components from the peripheral vessels towards the center. It is therefore probably no surprise, that in situations where the central cornea has a lack of supply e.g. of oxygen e.g. by an unsuitable contact lens, the peripheral blood vessels start to grow towards the center of the cornea. This will keep the corneal tissue happy again in terms of metabolism ... but negatively influences the higher order function of transparency. and thus impairs vision. from the inside via the anterior chamber fluid. A certain amount of supply comes from the marginal vessel arcade, that is located in the periphery of the cornea, termed as the corneal ´limbus´. Because the supply of the cornea depends largely on transport/ diffusion from the tear film, a contact lenses with a limited permeability, e..g. for OXYGEN, can be a typical problem for corneal well-being. Contact lens wear that happens to limit the supply of the cornea with necessary substances too much, can lead to problems such as corneal opacities, corneal ulcers, neovascularization of the marginal corneal blood vessels, or to impairment of the corneal endothelial cells, that continuously dehydrate the corneal stroma for reasons of transparency. Limited oxygen permeability has been more an issue in the past that is largely, but not completely, removed now, but it points to principal problems in contact lens wear. The main volume and structural backbone of the Cornea is constituted by the connective tissue of the STROMA. It is typically 500 micrometers thick, i.e. half a millimeter. Together with the typical thickness of the corneal epithelium of 50 micrometer and the negligible thickness of the endothelium of just a few micrometers there is a typical total thickness of 550 micrometers for the whole CORNEA. Normal values range from about 500 to 600 micrometers according to Duke-Elder and also to more recent measurements. The layers of the cornea can simply be derived, without much memorizing, from its basic structure (please see the image above): The main part of the cornea is the connective tissue stroma that is on both sides sealed by an epithelium. 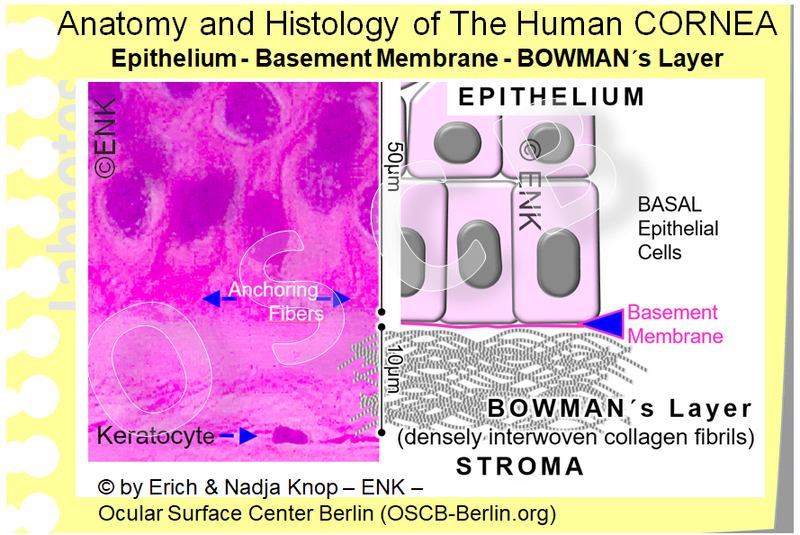 Every epithelium rests on a narrow basement membrane - this is a layer of fibrillar and non-fibrillar connective tissue molecules that served for mechanical attachment and also for functional regulation of the epithelium. In addition there may be specific characteristics that may justify a designation as a seperate ´layer´ - in case of the cornea this is Bowman´s layer in the anterior stroma. it covers the anterior stroma to the outside tear film - it seals the stroma against the uncontrolled entrance of foreign materials and provides some mechanical strength. It consists of 8 to 10 cell layers with a stratified squamous non-keratinized morphology and is typically 50 micrometers thick. BOWMAN´s Layer is the initial zone of the corneal stroma, directly underneath the very thin basement membrane , that is almost invisible in light microscopy. It is about 10 micrometers thick, consists of densely interwoven collagen fibrils and is free of cells. It ends where the first row of keratocytes occur and thus die highly ordered stacks of collagen lamellae start. A narrow layer of connective tissue, only about 10 micrometers thick, is the most anterior layer of the scleral stroma. It is located directly underneath the epithelial membrane and consists of a dense accumulation of collagen fibrils that are tightly interwoven. This most anterior layer of the stroma is free of cells. The main purpose of BOWMAN´s Layer is structural in order to provide a strong anterior limit for the stroma. Because the irregular arrangement of the collagen fibrils is distinctly different from their highly ordered packing in the rest of the stroma, BOWMAN´s layer is typically named as a separate corneal layer. Previously BOWMAN´s layer was often termed as BOWMAN´s ´membrane´ which suggested it as being the epithelial basement membrane. In light microscopy this may appear suitable, since in some organs of the body a basement membrane can almost approach this thickness. Electron Microscopy has shown, that this zone in fact consists already only of tightly interwoven collagen fibrils and is indeed the anterior part of the scleral stroma. The corneal stroma is the main part of the cornea - about 800 micrometers (0,8mm) thick in the periphery and 500 micrometers (0,5 mm) in the center. It is composed of distinct lamellae composed of parallel arranged, tightly packed and very regularly spaced collagen fibrils. The lamellae are typically reported to be stacked in alternating direction, i.e. the long axis of the fibrils in the lamella change from one to the next lamella. The highly ordered arrangement and the dense package with relatively low water content is thought to be the basis for the high light transparency of the cornea. DESCEMET´s Membrane is the basement membrane on which the cells of the corneal endothelium rest. It is quite thick for a basement membrane (please compare with that of the epithelium). The membrane is a dense accumulation of extracellular matrix molecules and it represents one of the strongest components of the cornea ... that may withstand when all other layers are already lost. This is the basement membrane of the corneal endothelium. Its thickness is between 10 to 20 micrometers which is very thick for a basement membrane. The thickness increases during life time with advancing age by continuous deposition of extracellular matrix material. DESCEMET´S Membrane is composed of typical basement membrane molecules such as collagen Type IV and glycoproteins that link the collagen such as fibronectin and laminin, as well as of proteoglycans. The corneal Endothelium seals the connective tissue stroma to the anterior chamber. it prevents the uncontrolled entrance of foreign substances including water from the anterior chamber and actively dehydrates water from the stroma through the action of water pumps in the endothelial cells. FUCHS Corneal Dystrophy, an inherited genetic disease and the most frequent dystrophy of the cornea with vision loss. It starts with alterations of the posterior part of the cornea (Descemet´s membrane and Endothelium) and leads to subsequent alterations of the stroma and later the epithelium. Descemet´s Membrane shows excrescences on its posterior surface, i.e. to the endothelium, together with cysts of the endothelial cells. This occurs in the slit lamp as roundish dots or droplets and is termed as ´cornea guttata´ (´hammered cornea´). Endothelial alterations leads to a progressive loss of endothelial cells with a respective loss of sealing and of pumping capacity. This results in edematous swelling of the stroma, opacities in the stroma with loss of vision and eventually also a bullous detachment of the outer epithelium (bullous keratitis). Towards the outside there is a uniform and thick stratified squamous EPITHELIUM. The HEIGHT of the epithelium of the cornea consists of several, about 8-10, layers of cells and is, relatively reliably, 50 micrometers. The cell layers are arranged one over the other, like bricks in a wall, which is characteristic for a stratified epithelium. The corneal epithelial cells have an extensive cytoskeleton of intermediate filaments (IF) along the cell periphery and around the nucleus. This occurs as a dense fuzzy pattern in the present resolution. The fibers consist of different types of cytokeratin. They join the basal cells with be underlying basement membrane (BM) as IF-Anchoring Filaments and link the cells with each other via desmosomes. Intermediate filaments act like ´ropes´ in the cell for the equal distribution of tensile stress throughout the epithelium. This results in an overall higher mechanical resistance of the epithelium. Cytokeratin is a normal component of all epithelial cells and does not indicate cornification. A squamous cell (small arrow) is seen in the surface layer and an adjacent cell (interrupted arrow) is about to exfoliate into the tear film. The LIFE CYCLE of the cells reaches from immature dividing basal cells over maturing intermediate cells to mature superficial cells. The flat squamous cells at the surface get progressively lost into the tear film. Exfoliated surface cells (see image above) can be seen in the slit lamp and strongly increase in numbers in disease states with increased wounding and cell turnover such as in Dry Eye Disease (for Details, please see there). New cells are replenished from the basal layer and the intermediate layers. The stem cells from which the maturing or still dividing cells originate are located in corneal periphery of the limbus crypts. Transient amplifying cells migrate from the periphery towards the center of the cornea. Transient amplifying cells have the ability for a limited number or further cell divisions until they terminally differentiate and are eventually shed as squamous cells. mainly ´Tightness´ as a barrier against the entrance of external environmental factors such as dust, pollen, microbes ... and even of water, as mentioned above, in order to support the desiccation status of the underlying connective tissue stroma. Tensile Strength is certainly another important function of the corneal epithelium, because it has to stand the frequent wipes of the upper eyelid margin during the blinks. The occurring frictional forces between lid margin and bulbar surface are limited by an internal built-in lubrication system in the Lid Wiper region of the posterior lid border. It is important here, because this region of the lid is actually is in touch with the corneal surface. The lubrication system is composed of many goblet cells and goblet cell crypts in order to provide a thick mucin-water gel on the surface for lubrication of the tissue interface. Still, there is no ´zero´ friction possible, because a certain lid pressure is necessary to distribute a the very thin and homogeneous tear film. The lid pressure comes from the natural tissue elasticity and from the mechanical force of the lid muscle. The MORPHOLOGY of the corneal epithelium lacks epithelial goblet cells, that produce secretory mucin, as occur in the adjacent conjunctiva. It must therefore be coated and thus made wettable, with the secreted mucin from the conjunctival goblet cells. This occurs by the wiping action of the eyelids during the blink. The Lid Wiper region of the posterior eye lid margin that actually wipes over the bulbar surface has a ´built-in´ lubrication system of goblet cells and goblet cell crypts that can provide plenty of mucin. The cornea consists mainly of a more or less rigid connective tissue ´button´ (stroma) to allow a smooth transmission of light without too much scattering. This is however NOT to be regarded e.g. as an inert ´Plastic Disc´ like a contact lens or as a ´built-in optical glass - first one is served free´ ... BUT it is certainly a living piece of tissue with a certain composition of layers for clarity and for providing the strength of the whole eye ball. There are also cells that serve for the metabolism and for maintenance and repair of the organ. The anterior part of the stroma is actually the strongest part of the organ and also the most ´viable´ one with most keratocyte maintenance cells. Cutting this away during refractive surgery has a certain inherent potential risk for a reduced stability of the cornea. The structure of the stroma is somewhat altered here as usually occurs in specimens that are treated by conventional formalin fixation. The lamellae, constituted of tightly packed collagen fibrils, have lost their strictly parallel arrangement and empty spaces occur between them due to swelling of the tissue before fixation. Occasional corneal ´maintenance cells´(fibrocytes/ keratocytes) occur along the collagen lamellae. The STROMA is typically 500 micrometers thick, i.e. half a millimeter and has a highly ordered structure. The corneal STROMA is the main part of the cornea. It is about 800 micrometers (0,8 mm) thick in the periphery and typically 500 micrometers (0,5 mm) in the center. The stroma, with exeption of its anterior thin zone BOWMAN´s Layer) has a highly ordered structure. It is composed of distinct LAMELLAE made of parallel arranged, tightly packed and very regularly spaced collagen fibrils. The lamellae are typically reported to be stacked in alternating direction, i.e. the long axis of the fibrils in the lamella changes from one to the next lamella. The highly ordered arrangement and the dense package with relatively low water content is thought to be the basis for the high light transparency of the cornea. There are relatively few resident connective tissue cells in the corneal stroma, because it is a dense connective tissue where fibers prevail. The cell are mainly ordinary fibrocytes, that are in the corneal stroma termed keratocytes for historical reasons. Keratocytes do not occur in BOWMAN´s Layer. In the rest of the corneal stroma, keratocytes typically occur along the lamellae of collagen fibrils. In addition to the fibrocytes/ keratocytes only few other cells exist. Some typically immature bone marrow-derived defense cells exist, that are progenitors of antigen-presenting dendritic cells. Keratocytes provide the ´maintenance service´ in the stroma because they produce the extracellular matrix of mainly collagen and proteoglycans and they can degrade, rearrange and repair it ... at least to a certain extent which is however not always satisfying for the patient and the clinician. A SCLERAL CONTACT LENS on the eye covers the complete Cornea including the limbal region in the periphery. ´Sclerals´ shield the cornea against external influences even during the blink. They continuously bathe the cornea in the patient's own tears. Due to new modern high-tech materials and curvature designs this is a ´rejuvenated´ medical tool for calming down chronic corneal dysfunctions and diseases in order to provide an environment for healing. For details please see the Section on Scleral Contact Lenses. By the use of Scleral Contact Lenses as a medical device, however, it is often possible to achieve surprising results of corneal regeneration for example in the clearing up of corneal opacity - conceivably because such lenses can shield external influences and can thus calm down chronic irritation (for details please see the section on Scleral contact lenses). The cornea is on both sides sealed by epithelia that prevent the influx of water at the outside (epithelium) and actively pump water out of the stroma at the inside of the stroma (endothelium). The Endothelium towards the inside, i.e. to the anterior chamber of the eye, is a very delicate thin mono-layer of Endothelial cells that have polygonal, typically hexagonal shape - similar to the ´cells´ in honeycomb. Integrated into the cell membrane are water pumps that produce an active permanent state of ´de-swelling´ of the corneal stroma - please see the histological photomicrograph above. The corneal stroma is thus held in a constant state of ´de-swelling´ that is, together with the regular arrangement of collagen. the basis for corneal transparency. Consequently, when one or both of the epithelia are wounded or become dysfunctional this can typically result in corneal swelling due to influx of water into the stroma with a resulting opacity in this region. This results in increased light scattering and decrease of visual acuity. The endothelium can be harmed not only from the inside, i.e. from the anterior chamber of the eye, but also from the outside, e.g. when oxygen diffusion from the environmental atmosphere is limited as can occur e.g. in contact lens wear with lenses that have insufficient oxygen transmission as was often the case in previous material generations. This limits the cell metabolism and the endothelial cell deteriorate in structure and function. Similar changes occur with advancing age. Some cells die then and others fill the gaps by increasing in diameter so that an irregular mosaic of increased cell size results in such cases of an endothelium with increasing de-compensation. The most frequent DYSTROPHY (which means a disease with ´abnormal cell development´) of the cornea that certainly leads to vision loss is FUCHS´ Dystrophy. This is an inherited genetic disease that starts with alterations of the Endothelium and it basement membrane and proceeds to the anterior corneal layers. ... you are HERE ! The corneal limbal stem cell niche is important for continuous regeneration of the corneal epithelium Deficiency of the stem cells for any reason can lead to overgrowth of the conjunctival epithelium over the cornea (conjunctivalization) with a resulting loss of transparency and visual acuity. The corneal epithelium is constantly replaced and thereby renewed from a stem cell source in the corneal periphery at the limbus. These epithelial stem cells are located in the so-called palisades of Vogt where epithelial rete pegs dive deep between stromal connective tissue papillae, that are arranged in a radial pattern. The constant renewal of the corneal epithelium is a prerequisite for corneal transparency and prevents the growth of the conjunctival epithelium over the cornea (termed conjunctivalization) that impairs transparency. In pathological conditions conjunctivalization can cover the cornea with an opaque epithelial layer that contains goblet cells and reduces the visual acuity drastically. A destruction of the corneal epithelial stem cells for any reason can disturb the visual function severely. It can occur due to e.g. chronic inflammation in severe ocular surface disease including end-stages of Dry Eye Disease, chronic mechanical irritation with potential onset of chronic inflammation by contact lenses, or chemical trauma in eye burns etc. The CORNEA does not contain blood and lymph vessels and it therefore depends on the supply with nutrients and blood gases from the peripheral marginal arcades - loops of small blood vessels - in addition to supply via the liquids of the tear film outside and the liquid of the anterior chamber at the inside through the epithelia. Since the cornea is optimized for light transmission it lacks vessels and it is therefore dependent on a supply with oxygen and nutrients via diffusion from the periphery. Supply is maintained in part by the tear fluid on the outside and by the fluid of the anterior chamber on the inside of the eye. Both of these fluids contain at least parts of the blood components including blood gases because they are in active and passive exchange with the blood. A certain amount of supply is also achieved by the marginal vessels from the conjunctiva and by the ciliary vessels that terminate and form loops often termed arcades and located as vessel loops in the periphery of the cornea, i.e. in the corneal limbus. Hypoxia of the corneal tissue leads to typical changes. Most obvious and well-known is probably the progressed growth of the vessels of the marginal limbal arcade, that typically stops there, onto the cornea. This is termed as ´Neovascularization´. (please see the image). Most frequently this occurs by inappropriate contact lens wear underneath the contact lens. Inappropriate means, that either the material has a low permeability for oxygen through the contact lens or the wearing time is too long, or both together., e.g. if ´extended wear´, which means ´overnight´ is done with a lens material that is not intended to be used this way.